A popular vegetable available all year round. The winter daikon is more sweeter where as the spring/summer daikon is more pungent in flavor. It can be eaten raw in a salad or pickles and grated for garnishes, or cooked in a broth or miso soup. Daikon low in calories and full of vitamin C and active enzymes that aid digestion. Best eaten raw to get the full benefit of it. Its leaves are also full of vitamin C, Carotene and fiber. 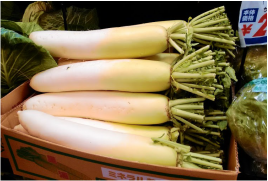 The tip of the daikon is usually more pungent so it is used as a garnish to add a kick to the dishes. The top part closer to the leaves is more sweeter so it is best eaten raw as in salads. The middle part can be used for cooking. So if you aregetting a only a half daikon, get the part that best suits your usage. Always peel the daikon before cooking. The skin is tough so you may need to peel it thick to get into the skin. If you have one with leaves, chop them off after you buy them or else the the water content will evaporate from the leaves and the root will dry out sooner. Wash the leaves thoroughly and boil in salted water.Save the unused portion covered with cling film in the refrigerator. A whole daikon can be wrapped in a newspaper until ready to use.